Clarence Earl Gideon was 50 when he was convicted of burglary in 1961. If you've heard of Clarence Earl Gideon at all, it's probably because of a movie you had to watch in school. He deserves better, though, because 50 years ago Monday he fundamentally changed the American legal system and your rights if you are accused of a state crime. In Gideon v. Wainwright, a unanimous Supreme Court declared on March 18, 1963, that the states were required to provide legal counsel for defendants in felony cases who could not afford an attorney. In doing so, it accepted the reasoning of a poorly educated Florida gambler and ex-con who wrote out his habeas corpus petition to the court by hand. Federal courts had been required to provide counsel for indigent defendants in felony cases since 1938. But over the next 25 years, the Supreme Court let several opportunities pass by to impose the same rule on state courts, which had discretion to develop their own ways to ensure a fair trial in cases that didn't involve the death penalty. "If an obscure Florida convict named Clarence Earl Gideon had not sat down in prison with a pencil and paper to write a letter to the Supreme Court, and if the Supreme Court had not taken the trouble to look at the merits in that one crude petition among all the bundles of mail it must receive every day, the vast machinery of American law would have gone on functioning undisturbed," Robert Kennedy, then the U.S. attorney general, said in an address in Boston later that year (.pdf). "But Gideon did write that letter," he said. "The court did look into his case. He was retried with the help of competent defense counsel, found not guilty and released from prison after two years of punishment for a crime he did not commit. And the whole course of legal history has been changed. I know of few better examples than that of a democratic principle in action." Today, indigent defendants are legally guaranteed representation across the U.S. But in the 50 years since the decision, the quality of their representation has been called into doubt. In a new book timed to mark the anniversary, "Chasing Gideon," author Karen Houppert argues that "we have not delivered on the promise of Gideon." "These public defenders I talked to were looking at 200 felony cases or 225 misdemeanor cases for a single attorney," Houppert, a former staff writer for The Village Voice and media fellow at the Kaiser Family Foundation, said. "As a result, they're forced to persuade people to plead guilty without investigating what actually happened, without talking to a single witness in the case," she said. "There are thousands of people languishing in jail without a lawyer — and thanks to budget constraints, people aren't really getting their day in court with a lawyer standing there defending them." Clarence Earl Gideon, 50, was arrested June 3, 1961, after about $5 in change and some beer and soda were stolen from a pool room in Panama City, Fla. Representing himself because the trial judge rejected his request for a court-appointed lawyer, Gideon was convicted Aug. 4, 1961, of breaking and entering with intent to commit petty larceny. He was sentenced to five years in prison. 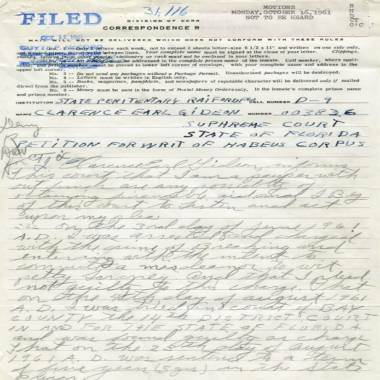 Read Clarence Earl Gideon's handwritten habeas corpus petition to the Supreme Court. While in prison, Gideon read up on the law, and he became convinced that the federal requirement to provide counsel had to apply to the states through the 14th Amendment, which courts have long held extended the Bill of Rights to the states. Hitting a roadblock when he sought help first from the FBI and then from the Florida Supreme Court, Gideon — probably with the assistance of his cellmate, Joseph Peel, a lawyer who had been convicted of killing a judge's wife — mailed a handwritten five-page petition in January 1962 to the U.S. Supreme Court, which agreed to hear his appeal. Bruce Jacob, the assistant state attorney general who argued Florida's side, believed the court was looking for a chance to overturn a 1942 case called Betts v. Brady, in which it declined to impose an absolute rule requiring legal representation for every indigent criminal defendant in noncapital cases, he wrote in a 2003 paper for the Stetson University Law review on the 40th anniversary of Gideon. His goal, he wrote, was to limit the scope of whatever new standard the court came up with. "We hoped ... that the new rule would not be made retroactive, because we did not want such a decision to result in the release of large numbers of prisoners from the state penitentiary who had been convicted without counsel," he wrote. If there was any doubt about the court's objectives, it was likely erased when the justices appointed Abe Fortas, one of the most prominent lawyers in America, to represent Gideon. Fortas was Vice President Lyndon Johnson's personal lawyer and was appointed to the Supreme Court just two years later. Never in the eighteen cases which I had previously argued in the Florida Supreme Court and other appellate courts had I encountered anything like the zeal and emotion that emerged in the questioning. Anger seemed to characterize my most relentless questioner. ... Florida's position was obviously hopeless; my ten months of work devoted to the case were of little avail. The decision came down two months later, written by Justice Hugo Black, who had been on the losing side of the 1942 Betts decision. "From the very beginning, our state and national constitutions and laws have laid great emphasis on procedural and substantive safeguards designed to assure fair trials before impartial tribunals in which every defendant stands equal before the law," Black wrote. "This noble ideal cannot be realized if the poor man charged with crime has to face his accusers without a lawyer to assist him." Five months later, Gideon was retried, this time with a court-appointed lawyer. The new jury acquitted him after only an hour of deliberation. 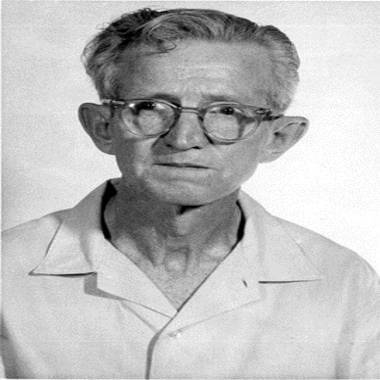 Clarence Earl Gideon died of cancer in 1972, apparently without ever again running into serious trouble with the law. Jacob wrote in his 2003 law review article that even though he was on the losing side, it was clearly the right decision. Jacob went on to a distinguished legal career — which included stints as a public defender and as an advocate for legal reform. He taught at several law schools, including Harvard's, and served as dean of the Stetson University College of Law in DeLand, Fla.
Forty-seven of the 50 states now have statewide public defender offices, according to the National Center for State Courts (individual counties serve that function in Alabama, Maine and Utah). Even if they're not always effective, those offices are a monumental legacy to Gideon, Houppert said. "It's incredibly moving to read Gideon's letters — he was making such a good and sincere argument. And it's touching to me that he was somewhat illiterate — it's full of spelling mistakes and handwritten in pencil," she said. "It's incredible, because he was nobody."